The federal government has finally released its proposed amendments to the Health of Animals Act Regulations (HAR) – the laws that govern animal transport. We have reviewed the amendments and are deeply concerned about them. Animals are spoken of as non-sentient commodities rather than the living, sentient beings they are. Arguments for any changes (as minor as they are) are outlined only in regard to their economic impact on industry. Animal advocacy organizations, including ours, have raised concerns about the rampant cruelty of animal transport in Canada for decades, repeatedly providing clear documentation of violations only to see a complete and utter dismissal by government. Many investigations have also clearly implicated Canadian Food Inspection Agency (CFIA) veterinarians and inspectors in the abuse, yet these violations too have been ignored. The amendments suggested by the CFIA ignore decades of research and actual existing legislation. Europe updated its animal transport regulations back in 2004 – over twelve years ago. Their regulations outline clear, specific rules based on animal behaviour rather than financial considerations. And their regulations are actually enforced through effective, proportionate and dissuasive sanctions. While the CFIA claims that the new regulations will bring Canada into alignment with EU standards, they won’t even come close. In Europe, regulations require that all animals who are transported longer than eight hours must be loaded onto trucks equipped with automatic water troughs and fans; that all trailers must be outfitted with tachographs which record the length of time a vehicle has been in motion; and that strict loading density requirements be met to ensure all animals are able to stand up and lie down in their natural positions. EU regulations also prohibit the transport of animals below and above specific temperatures and require temperature monitors on trucks. None of these requirements has been met in the CFIA’s proposed amendments. Of additional concern is that the proposed amendments specifically allow compromised animals (including those who are blind in both eyes, bleeding from an operation, or heavily lactating) to be transported for up to 12 hours. Previously, sick or injured animals could not be transported if it was expected to cause undue or additional suffering. Boar bashing and tooth-breaking have also not been addressed and no regulations have been outlined against either practice. In Europe, boars are segregated during transport to avoid the blatant cruelty that both bashing of boars (with crowbars and baseball bats) and breaking of their teeth (snapping off their innervated tusks with bolt cutters) entail. 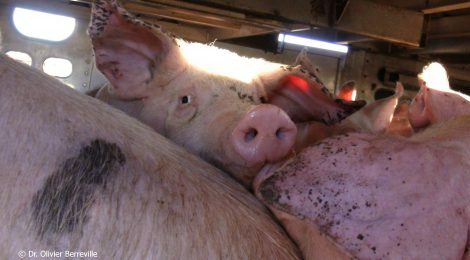 Trailers carrying animals also continue to not be given priority at border crossings, affecting 2.5 million pigs each week who are shipped to the United States to be slaughtered. This is particularly a problem in the summer months when temperatures inside a truck can quickly reach 40˚C to 50˚C. This, combined with high ammonia levels, can cause death by suffocation. Electric prods also continue to be allowed. Other violent handling practices, such as the lifting of animals by their legs, head and horns, continue to be allowed while EU standards prohibit all of these. And finally and perhaps most importantly, the amendments fail to cover actual enforcement of the regulations. It is as though the CFIA hasn’t ever been in the field or seen any of the evidence we and other animal advocacy organizations have provided over the years of the rampant cruelty inherent in Canada’s animal transportation system. CETFA will be providing its own submission on the proposed amendments, but we ask that you do the same. Feel free to use the concerns we have outlined here, but do it in your own words. Responses that are too similar will only be counted as one submission, so it’s important that your submission be unique. Please send your personalized submission to Dr. Cornelius F. Kiley at animaltransportanimaux@inspection.gc.ca by February 15, 2017.